Her apparitions at San Sebastian de Garabandal, Spain, in 1961-65. Ruling pope was John XXIII. John Paul II was in office when the Medjugorje message was given. He was succeeded by Benedict XVI in April 2005.
between correlated C and B values. London C-254 minus London B-74 = London D-180. (or 0, as for the first ten letters). I’ve chosen to include a chapter on popes. The reader will soon se why. The appearing Mary’s prophecies, quoted on this chapter’s title page, was an initiating reason. Other reasons appeared to join in. A new era in the Roman Church was introduced by pope John XXIII, the jovial and friendly successor of Pius XII, the war-time pope, concluding his work through Vatican Council II. His civil name was Angelo Giuseppe Roncalli. The square in front of the giant cathedral of Cologne, Roncalli-Platz, is named after him. Among the signals he gave of a new direction was his starting dialogues with other churches. Also, he was concerned about workers’ economy and the need of aid to developing nations. His view of the world as our common home was clearly exposed. Soviet communism was still active, with its persecutions and concent-ration camps. But when John XXIII entered the papal chair in 1958, Stalin had been dead for half a decade, and signs of a coming change had kindled new flames of hope. The new wind blowing from Rome had an immediate global effect. But John XXIII died soon after the Council and was succeeded by a far more stern and rigid intellectual, Giovanni Battista Montini – Paul VI. The announced concerns by John XXIII had made a vital difference, though. When Paul VI died in 1978 he had introduced a new papal style, visiting many nations on world-wide journeys. The next pope, replacing Paul VI, had like John XXIII been raised in a poor family in a rural, remote part of northern Italy. Albino Luciani. He was the very first taking a double name: John Paul. In praise of his predecessors, he exclaimed. The visionary apostle, John, and the first great theologian, Paul, are the very background, though. Albino Luciani must have felt a need to re-establish a contact with the root – symbolized by those two (quite different) parts of it. The two pioneers may seem like a unity-in-duality symbol – unified in the common spiritual service, yet different like the halves of the human brain: John being the right side; Paul, the left. Light and bread. To be re-united. However, the double name even included a number. ‘John Paul the First’, was his answer when asked for his papal name. Even that choice was unusual and unexpected. “Ioannes Paulus Primus”. It reflected a radically considered purpose. It is as if he knew intuitively the need of a succeeding Secundus. What he did know, however, was his own call to mark a new beginning. To be that new beginning. He also knew that John XXIII and Paul VI were included in that new be-binning – not least as initiators. Even these two were like brain halves – halves of what was to be radically reformed. Light and bread. 7 and 12. His assignment was to transform this duality into unity. Met by a spontaneous wave of joy from the crowd on Piazza di San Pietro, he immediately was recognized as ‘the smiling pope’. He had things to work, however. From day one he was preparing the carrying out of his vision. After 33 days of rule he was dead. A global shock. How? Why? Do search for him on the Internet; on the Vatican’s home page he’s hardly mentioned. For good reasons Wikipedia is more communicative. Ask yourself why. This open-faced, whole-hearted successor – the very gate to restoration – why was he silenced? And why this silence? Thirty-three days, and six bells go ringing. The six ringing bells are those at the front of San Pietro in Vaticano. I’ve heard their grave song. Pope Pius had died; his body on lit de parade. I was in Rome, and the timeless melody is engraved in my memory. A renowned American journalist, David A Yallop, faced the circum-stances of the sudden death of John Paul I in his book, ‘In God’s Name’. His conclusion after three years of intense, professional research was, ‘murder’. The new pope soon had introduced a shaking program: to reform the Vatican, questioning the interior and exterior policies of the Vatican as well as the Church in general. In addition, to announce new perspec-tives on sexuality and women. Several other themes were on the chart, too. Automatically, Vatican officers, Italian bankers, mafia interests and many others of power were possible papal targets. Consequently, he himself became a target. After a modest evening meal the 28th of September 1978 he went to bed. The following morning he was found dead. It may have happened some hours after midnight, the 29th. His body was embalmed at record speed. Against open protests in mass media. Suspicion was whistling sharp-pointedly in the air. The new era of the Church had got a fatal shock. A promising turning point had become a threat against pillars of power. His program was annulled. And his successor… chose silence. The policies of the Roman Church continued as if almost nothing had happened. The highly revered Pole John Paul II and the entire Vatican remained mute. In God’s Name. Ruling wills have, to some degree, succeeded in quieting the case out of existence. This adds to my reason for this odd theme here and now. Numbers have chosen to speak. Mary’s prophecy at Medjugorje said that only one pope would succeed John Paul II. Could this be empty talk? We’ll see that Albino Luciani’s goal was a turning point. Numbers will speak where words cease. What John Paul II in silent hours may have revealed to his confessor no one will know. What Benedict XVI may think or know we can only guess. So, what can numbers reveal? edifice and its immaterial partner, the Superior Pyramid. The height in secret cubits is 18.179.
giving a possible announcement of fulfillment. towards Golgotha, ~ EN 2720ac = 27.2 deg. (c) The two John Pauls make the sum 1818 together – see (a). (d) A number without numerological qualities. (e) 2331 is 7 x 333, the Hebrew/Aramaic D-number of Jesus’ name Yeshúa. 1 – 6; and 111 as the threefold mention of the divine symbol of (the) One. 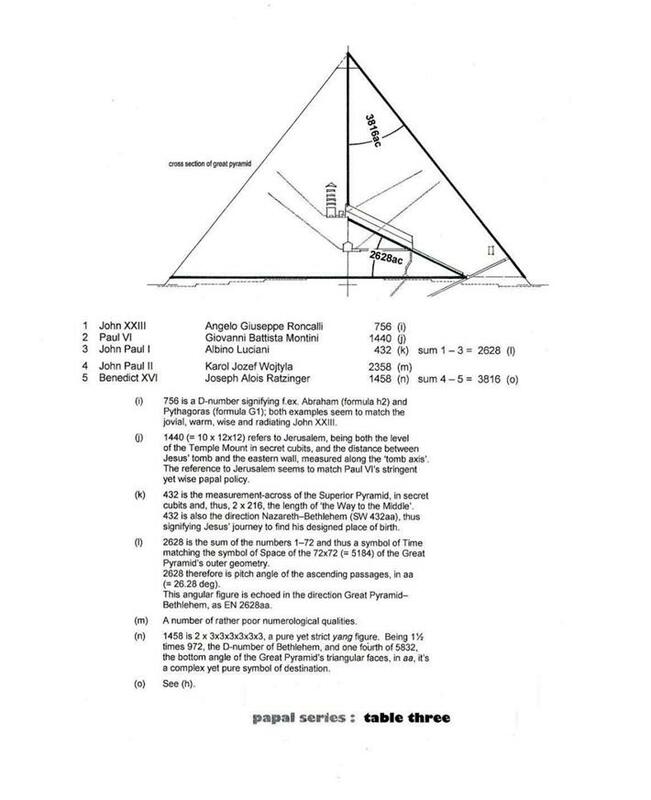 pitch angle of the roof slabs covering the Great Pyramid’s Top Chamber. Table One. Latin is still the official language of the Roman Church. The five popes, from John to Benedict, make a group. The post-World-War group. The group of new approaches. Automatically, the sum of the first two makes the numbers of each of the next two : Ioannes + Paulus = Ioannes Paulus = 909. Only the final number breaks off from the John-Paul line. Number five is different. John Paul I closes the initial part by summing up to 1818. The number of Mary (and Moses). It’s the numerological version of the Capstone’s height, 18.179 uc. A sign of fulfillment referring to the invisible. An to a unique symbol of One. The two last popes form the sum 1485 – the sum of the numbers from 1 to 54. 54 is the numerological height of the Great Pyramid’s Threshold. And also the diameter of the Sun, as seen from the Earth. Both measure-ments in aa. Signs of fulfillment, yet different. Together they make a sum of 3303, a number of no clarity. Two time periods show up. But also the four – all three versions of 909 – make a distinct image of connection and unity. Benedict disengages. Table Two. Was Albino Luciani fully aware why he included ‘Primus’ in his papal name? The question is worth a book, or, at least, a study: A whole series of expressive figures appear. The first breaking sum is 2331 = 7 x 333 (Aramaic Yeshúa and English Christ are both 333). Which also equals 3 x 777. 2331 is the numerological height of the Pyramid’s passages and of the sitting prototype body’s height from rear to Superior Crown – a symbol of Man’s spiritual fulfillment. Corresponding the size 2.3355 uc. The next breaking sum is 3240, a number reminding us of the Top Chamber roof whose pitch angle is 3240ac. 3240 is 15 x 216; the factors being the sum of 1–5, and 6 x 6 x 6, respectively. The final sum has a profile of its own, as well: 3816 is the angular span between the Pyramid’s vertical axis and exterior faces, complementary to 5184(ac) – the Pyramid’s self-realized 72. This figure invites a further comment. It will appear overleaf. Table Three. The angular span of 3816ac seems important. And so does the number of ascent, 2628. Both are exposed in this new table, referring to the popes’ civil names. The name of John XXIII was Angelo Giuseppe Roncalli. Paul VI’s was Giovanni Battista Montini. And John Paul I’s civil name was, as we’ve seen, Albino Luciani. The three make the sum of 2628 together! The final two produce the number 3816. The references to the Great Pyramid’s way of exposing symbols of purpose seem all too clear to be ignored. John Paul II’s name was Karol Jozef Wojtyła (2358; pronounced vóytiwa). 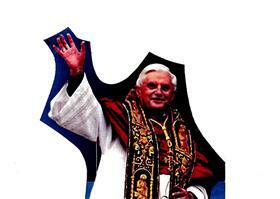 Benedict’s civil name is Joseph Alois Ratzinger (1458). Two zones of numerical message are announced. The first is 2628; the second, 3816. 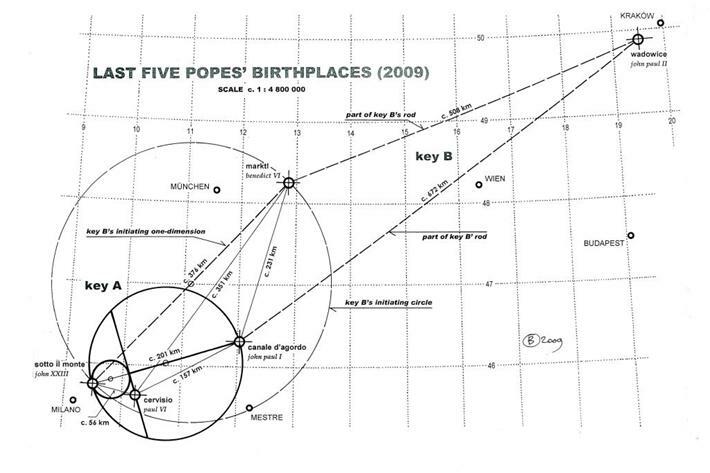 The message is as follows: The three first popes realized the climb to the inner Middle. And number three, John Paul the First, was the one touching the front of the very Threshold. Then the Pyramid seems to close. The inner process of ascent is ful-filled, although without a mounting of the Threshold. The picture is frozen at the Threshold’s foot. The completing picture is different, referring to the Pyramid’s apex. The point of God’s eye. The angle of 3816ac, spanning the gap between vertical axis and outer face, may tell a story of a fulfilled ‘Way to the Middle’. As if confirming and sealing the first fulfillment – the inner. From outside. The story unfolding explains that the interior process is followed by an exterior, the latter announcing a closing off. A final message, a ‘Finito’. The two Finitos expose and explain one another. Is the appearing Mother’s message about the final pope worth listening to? If so, the Vatican’s refusal to recognize this specific Marian appar-ition, having lasted since 1981, seems rather ‘natural’. announcement of a here-and-now, a mark of presence. (see (i)) and, in addition, the D-number of Joseph (Yosef meNatzerat). “The one elected pope will be mocked by his electors. This enterprising and prudent person will all of a sudden be put to silence. They cause him to die because of his too great goodness and mildness. Many an alert reader will recognize a prophet in the Australian author, Morris Langlo West. Half revealing, half hiding. Hiding in the chap-arral of words of fiction. Revealing through symbols of reality. In his book ‘The Fisherman’s Shoes’ he foretold the coming of a Slavic pope. In other books he prophesied assassinations and papal deaths planned and caused by secret networks. When the aged Morris West was asked about his opinion as to David Yallop’s ‘In God’s Name’, he just said, “Read, and make your own judg-ment…”. When Cardinal Ratzinger had been elected pope he burst out to the vast celebrating crowd, “Pray that I’ll be protected against the wolves!” One may guess he very well knew the actual categories. The meaning seems quite plain. Pope Benedict XVI tries not to focus on the slack rope of his balance. The shadows are alive, however. The apocalyptic dragon; the wild beast; the Illuminati; the mafia; militant movements; inside shadows; ghosts from past and present; eco-crisis; economic breakdowns; militant religious threats; signals from the outer space … whispering and spooky voices from nowhere and everywhere. Who knows … Mary may have changed her message. The Mayan Calen-dar may prove inadequate or misunderstood. The Threshold may still be a challeng-ing possibility. Possibilities are possibilities. But only that. Table Four. What’s be around the next corners is always unknown. The numbers have spoken, however. Numbers that do not know their riddles. But the riddles know them. Speaking through them with striking certainty, as if recorded in ages forgotten. Even the final table reveals a potential message, given in today’s world language. 216 is the number of the Way to the Middle. Step by step the series approaches its concluding sum, 1512, which is 7 x 216. The number of Yosef. Giuseppe, Jozef and Joseph … echoing. Table Four displays two leading symbols, 216 and 7. 216 is 6 x 6 x 6. The three-digit symbol of 666 may echo, yet only indirectly and kept tightly between 333 and 1332. 7 is the holy 6+1 – the number of the Week, the temple candelabra, the level of the Superior Crown, and the perpendicular height of the Great Pyramid passages, measured in chakra interval units. The symbol of 7 possesses a special role in the Bible, appearing in a variety of ways. 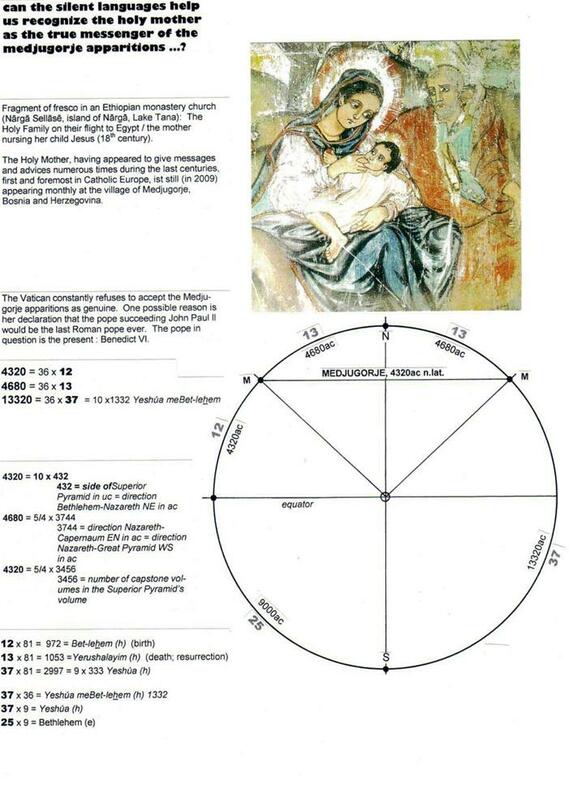 Even the number of measured sacred time, 1260, is a multiple of 7. Pope Benedict is himself the very module. 216. Like the figure of 666 being kept between 333 and 1332, the number of the Way (216 = 6x6x6) is kept between the top square (108 uc) and the line of transition (432 uc). Born at Marktl, just 15 kilometers from Braunau (D-666, the birthplace of Hitler), he will fully have felt the shadows of evil. From many other directions, as well. And a final question is still unanswered. It is like a rumbling ghost or a raised tsunami wave nearing in slow motion: What will come next? The question is agitating – due to the Holy Mother’s message as to the ‘last pope’. We don’t know the answer. Does her message say that the next pope will not be accepted as pope – by Heaven? Is a dangerous change in Church leadership waiting round the corner? Is a trap ahead, fatal, unavoidable? Are wolves closing in? In case Benedict will be given to conclude the ‘white’ papal ministry the five civil names could possibly give a hint. The sum of 2628 and 3816, 6444, is in itself a rather blank figure, though. Can some completive addition reveal what may be in store for tomorrow? Do the D-names suggest some self-explaining, ground-breaking solution, one of hope? The repeatedly mention of ‘Joseph’ seems a cue. I intuitively came to add the 1332 of Yeshúa bar-Yosef. A ‘son of Yosef’ – thus matching the papal line – but, nonetheless, the Son-of-One. Jesus? Himself? Taking over? The mere idea is shocking: the left-side brain-office protests. But the sum total would be 7776, the very crown number of the Tree of Modulation, marking the fifth level on its trunk. The symbol 7776 has revealed some of its attributes already ( pp. A-74; B-192f). No pope, and yet: a successor? Yeshúa? The witness of the Only Father? A closer look at Garabandal may be necessary. This mountain village in northern Spain is located at 444ac w.long. and, like Medjugorje, at 4320ac n.lat. This collective marking, as well as the very numbers, seem a point. From July 2nd 1961 The Holy Mother was seen about two thousand times by four poor girls (11-12 of age when the visions started). Among the messages given were a warning against a new and sudden wave of milit-ant communism; the proclamation of a divine act of punishment to con-vince of indifference and ignorance; and a great wonder which in due time would be performed above a grove of pine trees crowning the hill beyond the village. This last event would be one beyond any comparison. One of the girls, Conchita Gonzales, when reporting Mary’s prediction about three popes designed to succeed John XXIII before the ‘end of times’ (but not of the world). She later (in 1965) corrected herself, saying that the Holy Mother in fact had mentioned yet another – one she for some reason didn’t include as pope. Mary had also said that one of the four would have a very short time in office. Both the main message and the later correction came to cause rumour and confusion. The idea that first struck my mind was that Albino Luciani was the man in question – not only the one getting a short period as pope, but the one unworthy the papal role. The thought hit me like a stroke. Had I been so wrong? Was Heaven’s will so different from what I had imagined? Was even the entire scope of roles, names and numbers just a black joke? Was Luciani after all a turned down project, a blunder, a discarded vessel? The idea, however grim, had to be tested. Mary spoke of ‘three popes after John XXIII’. Then she mentioned a fourth, one who for some reason wasn’t to be included or taken into account. In addition, one of the four would have an exceptionally short reign. Three popes succeeding Pope John XXIII. Was Benedict to be excluded? 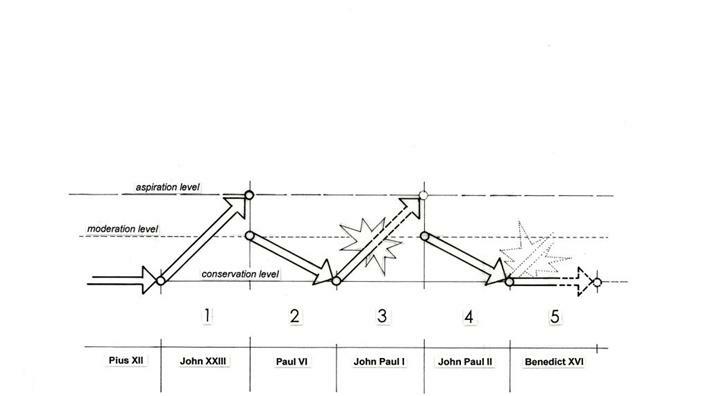 I added the civil names of Paul VI, John Paul I and John Paul II, getting a sum of 4230. Then I dropped John Paul I and included Benedict and got the sum of 5256. 5256 – two times 2628 and, thus, the number of the com-plete ascent! Albino Luciani – what was so totally wrong about you? To be added: It’s proven that all the popes after John XXIII, including Benedict, have declared their faith in the Garabandal phenomenon. My following meditation or prayer or silence – what is what in such a tunnel of distress! – came to an end. All of a sudden I saw the picture – a picture explaining the entire problem. In fact, Conchita’s final articul-ation of the message she’d received indeed made sense. Albino Luciani was the pope Mary didn’t take into account. He was also the one getting a short reign. Luciani was the very point to focus on. He was not to become a pope. Nonetheless he had to be elected. He was designed to be excluded, although his inclusion was necessary according to the ruling system of authority. He had to be included in order to be excluded. He, the only mirroring the Way-from-the-Middle and the Way-to-the-Middle, 2 x 216 = 432 – both by his civil name and his papal – and who had affirmed the fulfilled ascent’s 2628 together with his two predecessors – he was, simply, the Different one. Albino Luciani was different. According to this, his role and destination were different, too. He was given the papal chair to be at the proper level of announcing his role as a prophet, a guide, an illuminator – not to con-tinue as bishop of Rome, secretary general of the Vatican, or one running the World Church business. The three popes succeeding John XXIII would make it without him. They would be confirmed by the sum of 5256, the symbol of the complete ascent. He was removed from this entirety to lie down and be a most abstract line: the Superior Pyramid’s measurement across, or rather, to be the sacred bigon running from the Middle and out and then leading back again, right into the Middle. Being the complete bigon of the Way. So, after all, the enigma of Albino Luciani may be no odd puzzle. The prophecies from Garabandal and Medjugorje (seemingly different yet fully matching) seem the keys to the one and same door: a most alarming exit. But, possibly, one of a certain hope, too. Albino Luciani may have been given a different chair and level for the program entrusted him(?). Whether or when the Vatican will include him among the appointed saints may be rather insignificant, at least to himself. What he left behind is a challenge. The line in the Pyramid quoting his number is horizontal, related to the very floor of a world of human action and passion. It doesn’t belong to soil level, however, but to the spiritual Pyramid, the one kept by the holy apex resting in the centre of the Descended Sphere. I still had the feeling that more was in store on and between these lines. The events ahead were alarming. More close attention to the signs given could be important. To get further assurance that these odd ideas had not been a misleading dream vision, I intuitively went back to the birth-places of the five. A larger map scale was necessary. 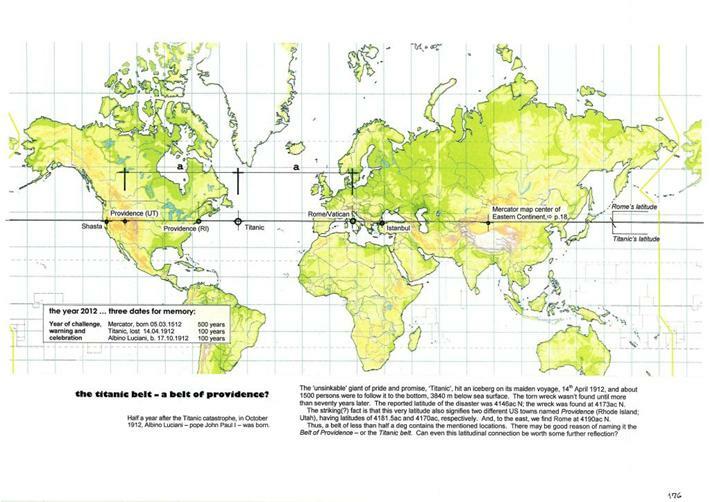 My world atlas (Rand McNally / Cappelen) offered the data needed. 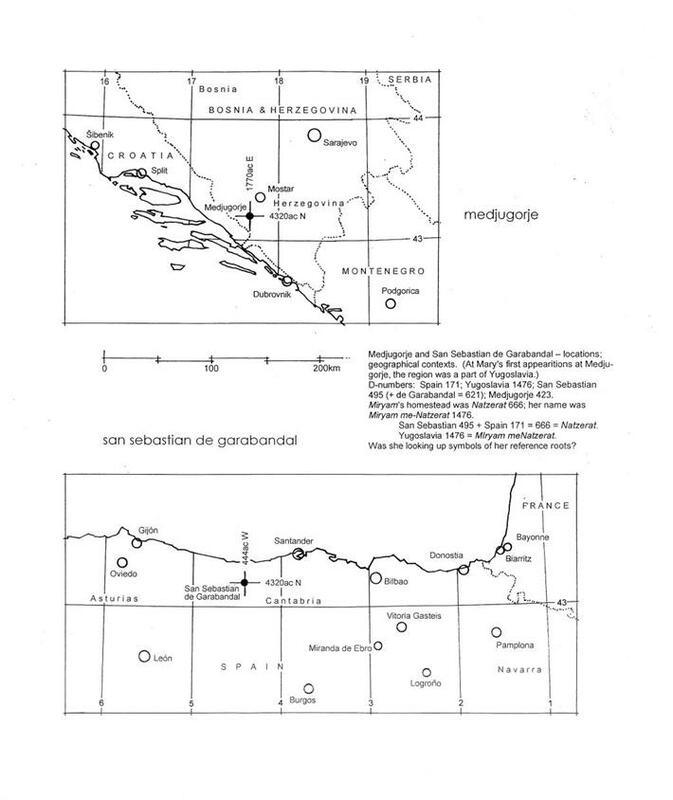 A Mercator map would possibly reveal geomet-ries of interest, but the modest distances – about 800 km between the farthest places – made me make use of the adapted map projection. John XXIII was born at a small place called Sotto il Monte, in Lombardy, not far from Milan. Only 56 km away we find Cervisio, the birthplace of the next pope, Paul VI. And northern Italy would offer the world yet another before the great change, this time from the district of Veneto: John Paul I was born in the small village of Canale d’Agordo (in his childhood named Forno di Canale), situated about 100 km north of Venice. He came to introduce more than one great change. Exit Italy. The change of scale happened as the Polish John Paul II came from Wadowice, located near Krakow, more than 670 km from the village of his pre-decessor. And Benedict XVI was born in the Bavarian Marktl am Inn, east of Munich. Intuitively I drew a direct line between the two popes of Renewal – John XXIII and John Paul I. The spiritual connection between them was too obvious to be ignored. Paul VI wasn’t to be found on this line, but a Key of Transition (Key A) med him fit in, connecting the other two. Paul VI marked its line of transition, but outside the very axis. The Key amplified the image of connection between the first and the third. Paul V seemed … a reserved confirmer. The large stretch to Wadowice showed no significant connection to any of the former places. Was Wadowice part of a bigger pattern – f.x of the loop ending at Marktl? The idea was well worth a try. The whole loop measured some 1180 km. And from Marktl the distance back to the start at Sotto il Monte was 376 km. The figures proved to deliver a message. The figure coming out was another Key of Transition (Key B). Bent and composed, yet still a Key. 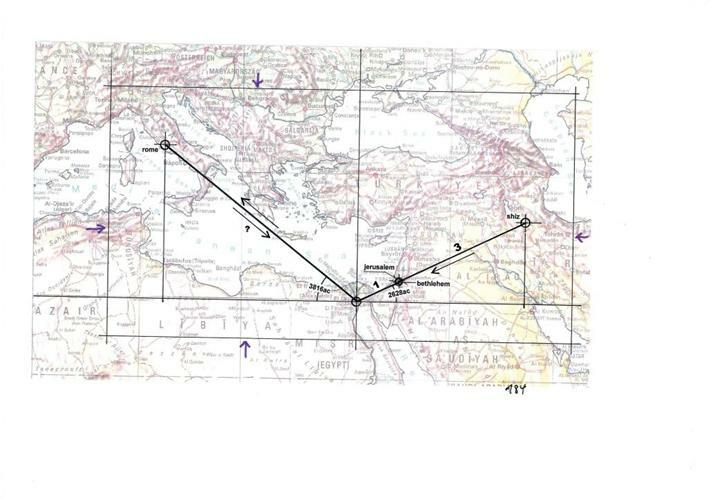 The loop from John Paul I via John Paul II to Benedict was exactly pi times the closing distance. The big loop seemed to end where all began! 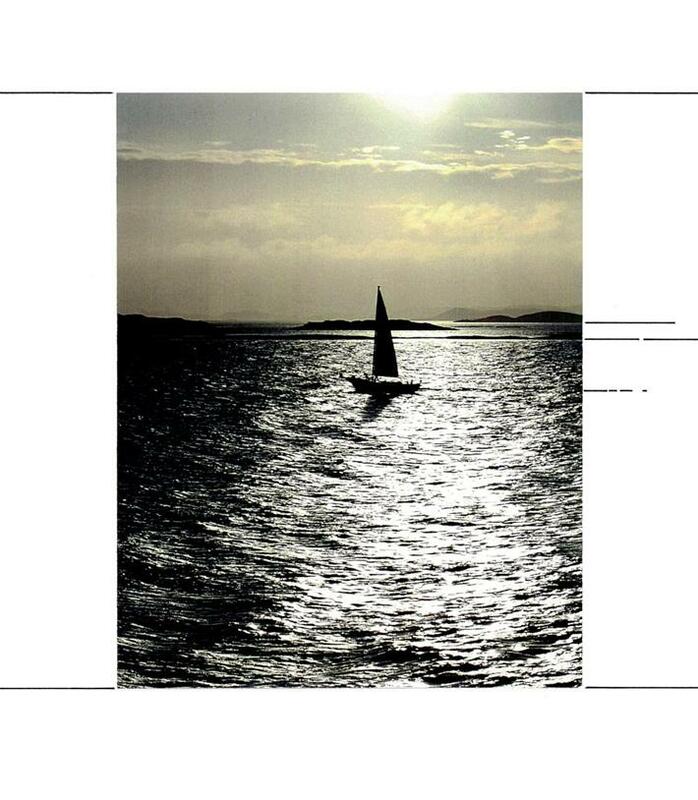 But no: the figure explained itself differently. It explained that John XXIII be the very initiator of both Keys. Both Keys started at Sotto il Monte. To end at Canale d’Agordo. The two Keys was a geometric design insisting to be read as a documentary. Albino Luciani holds both ends. Virtually, he was himself the very End. The pope whose name and title were identical. Albino Luciani = John Paul = 432. He was the one to close the circuit. Were the last examples too far-fetched to be taken seriously? Have I overdone my observations, using inadequate methods? I don’t have any objective answer. What I know is that the ideas entered my mind with-out being products of complex, willed manipulation. I thus think they’ll have to defend themselves. My job has been to visualize them. I drew a new line. 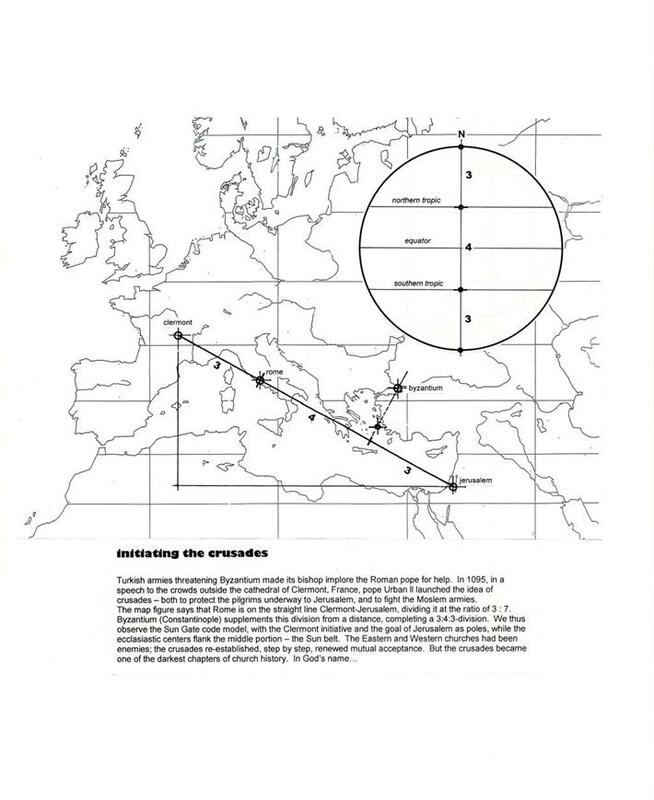 A sunrise line heading eastwards from Rome and Vatican. I then added the 3816ac of the ‘closed’ pyramid. The southern line hit the Great Pyramid – the instrumental origo of Moses and Jesus. The northern hit Chernobyl, a sign of explosive warning and catastrophe. To be sure the design had a measure of consistency I made the Pyramid meridian represent this Pyramid figure’s bottom line, then added the lines of its related Key of Transition. 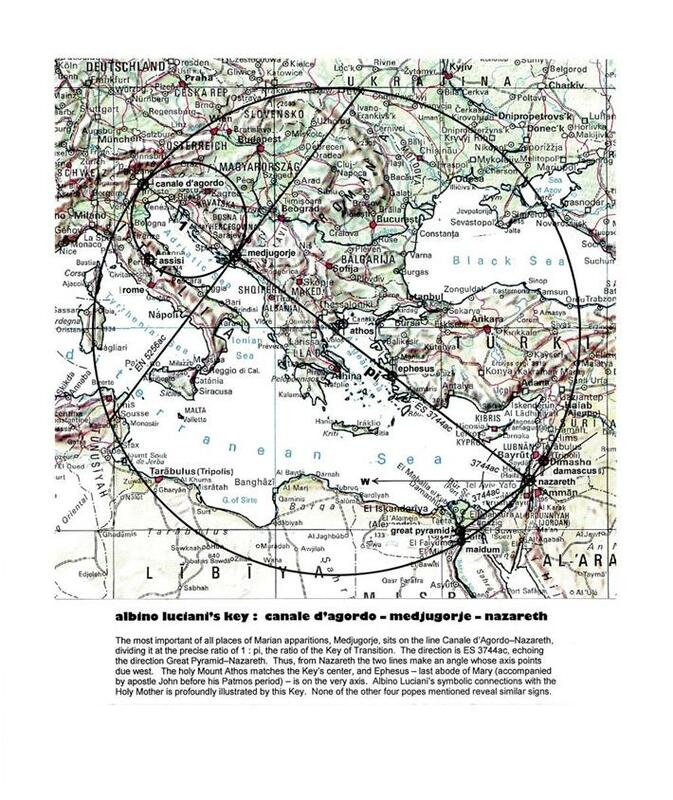 Four key cities now proved to match this pyramid triangle’s key levels: Jerusalem: center of the initiating circle and the Bottom Chamber roof level; Istanbul: the Middle Chamber floor; Bucharest: the High Chamber floor; Sofia: the Top Chamber apex level. In addition, the Delphi oracle was on level with the Key’s center. What appeared here was a sundown Key. Catastrophe, terror, magic, assignment and wisdom were baked together. 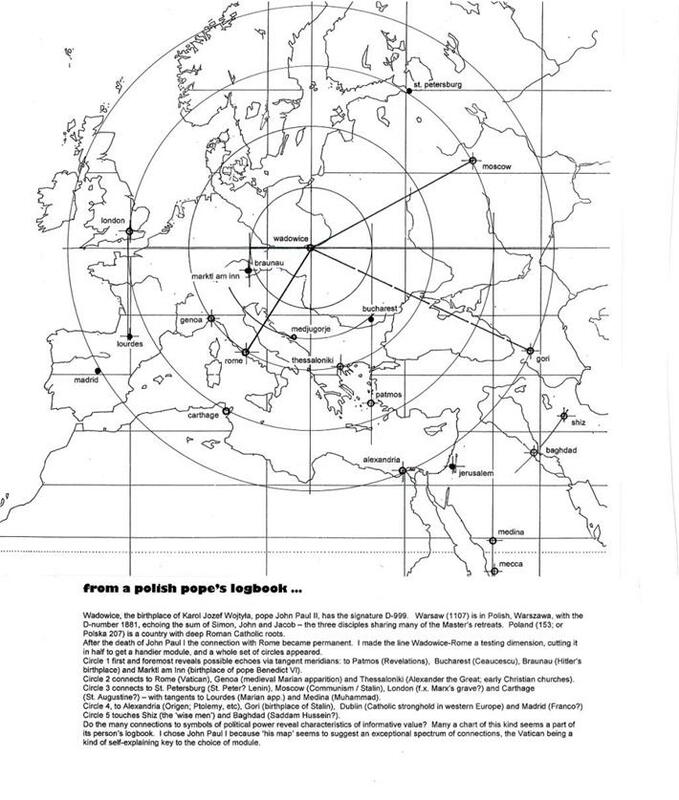 Jerusalem in an initiating position; the Great Pyramid acting as transistor; and Rome on top of the entire circus. Yet another inadequate sign? Yet another affirmation? Despite shining mottos and promising words the gravitation of conservatism - the left-side brain tendencies of the Church - managed, more or less, to drag the rising waves of aspiration and hope back down to standstill level. Roncalli and Luciani were the two sticking to ideals bred in poverty, but their goals were either moderated or crushed. The popularity of John Paul II may have been coloured by an element of forgetfulness, wished thinking, shortsighted emotions and the need of the image of a caring father. The Vatican's constant silence concerning Albino Luciani's death has seemed to turn the vivid stream of his short rule into a buried pipeline. The hopeful aspirations were not going to survive. Neither did the pulse. The process was chocked. The aftermath, including the waves of chocks harassing the Church from inside ... could in no way be consistent with Albino Luciani's aims. His announced prophecy of inner renewal has ended in a void of continued concealments. His divinely guided vision did not incarnate - to give the Church a puryfying chance. So: Is he occupied realizing Heaven's plans... in his present state of being? A complementary sign(? ): Jesus' forerunner: John the Baptist. Albino Luciani's: Giovanni Battista. Similar roles; identical namings! At times, perhaps to help recognition, the great Manager seems to reveal a refined concern for precisions ... To be unaware of them may (of course?) be dangerous. He succeeded the first pope in the series, Angelo Giuseppe Roncalli, 756. Together the two make a sum of 2790. The next was Albino Luciani, 432, succeeded by Karol Jozef Wojtyła, 2358. The very same sum appears, 2790! Can this repetition be a matter of mere chance? So, once more the Yeshúan key number comes up. Will someone appear who has taken or received His number? Or, can it be Jesus … returning? Roncalli (John XXIII) was a renewer, a fresh spiritual impulse, while his successor was conservative, intellectual and rather strict. Luciani was a renewer, a fresh spiritual impulse; his Polish successor was conservative and strict, although jovial and warm. A pulse is seen: opening upclosing, opening upclosing. And the equal sums, 2790 – 2790, confirm the pulse. So, what about Benedict? He is definitely conservative and hardly a fresh, renewing impulse. In addition, the symptoms of resentment towards pope John’s concluding program – the Second Council – has gained new admittance within the church. The left brain half once more seems to take the lead: the pulse is choked. In addition other negative signs have surfaced. Trouble. Does the possible fulfilling ‘1332’ refer to the Hebrew Yeshúa, and thus be regarded a ‘Hebrew’ symbol only? Or is His number universal? Was He first and foremost a ‘1332’? Were His two local names, both counting 1332, given Him to make clear that the number is the essential factor, and not the name? Is He still ‘1332’? Throughout the ages? Eternally? three wise men – plus two… ? may continue to reveal grave amputations. symbols connecting prophetically to the popes John, Paul and John Paul I? Incense, gold and myrrh? Strange yet blinking questions. the facts about his fate, thus sealing a chamber of alarming knowledge. The new question: What if this holy scheme was still unfinished? astray. An alarming sign. Or, could my reading be wrong? Shiz and Rome – happen to meet at the very same goal: the Great Pyra-mid. Child who defines and explains this common point of connection. and Space: the wordless Word of the Beginning. Once again logometry may assist our reading. Albino Luciani’s ‘1422’ – as Ioannes Paulus Primus – is a doubled 711. It may thus even be read as two composed 711s. A Hebrew 711 is Yohanan. John. Ioannes. The Latin 711 is Paulus. In other words, the sum 1422 covers the composed Ioannes and Paulus. Albino Luciani is announced as a connector between two eras. As a Hebrew-Roman bridge spanning a gap of two millennia – from a Baptist receiving Jesus at River Jordan, or an apostle who experienced Jesus’ special devotion – to a pope who was designed a prophet, thus having to leave the papal chair before getting glued to it. The bridge is expressive and its definition very reasonable. 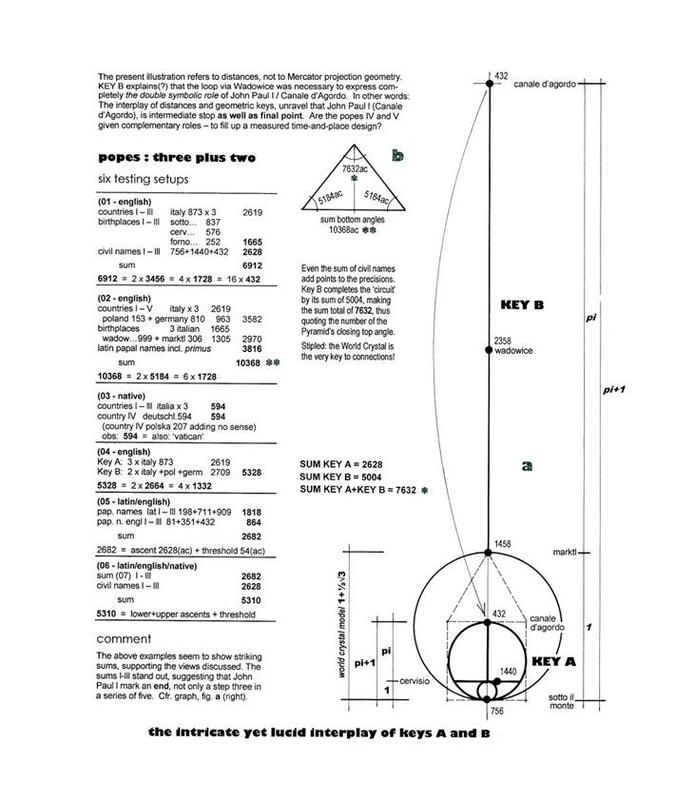 If adding 54 – the angular figure defining the angle of the lifted ascent by the Pyramid’s threshold, or the diameter of the Sun as seen from the Earth – we get 1476, the prominent Yeshúan and Marian key number. Readers wanting to follow these logometric traces further may find more. I decide to make a stop here. A too large basket of data may choke what it was meant to release. My conclusion concerning the roles of Albino Luciani is affirmed. The additional Antichrist reflections make new questions appear. The return of Jesus Christ seems more easily pronounced by numbers than by tongues. The ribbon of exposed messages vibrates. It is exposed to make our listening eye focus and, most likely, to help us face days of trial and radical changes with hope. We are introduced to a landscape where no ‘natural science’ is able to guide us, but where our own presence may be necessary for the landing of … Divine Presence.